The Belvedere Hotel was a pub near Belvedere Station. 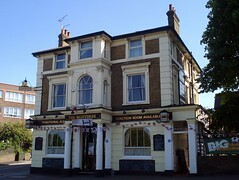 According to the April/May 2019 London Drinker, it was sold in December 2018 and is now closed with its future "uncertain". Pub near Belvedere Station. It's at the bottom of the rather steep Picardy Road toward Upper Belvedere, and also very handy for the bus stop toward Bexleyheath. It had a change of management in early 2017 photo of sign; see earlier version of this page for what it was like before that. Inside, it's a small single room, with pool table and dartboard on one side and seating — a mix of banquettes and low stools — on the other. Paintwork is in shades of browns and creams, a geometrically-patterned carpet is on the floor, and two fruit machines flash silently at each other across the bar. There's a small but decent enough beer garden out the back, with grass and shrubbery, and although there's a fair bit of traffic noise out there, the pub is set back from the main road so it's not too bad. Kake visited on a Saturday afternoon in September 2017. No music was playing. There were three or four other customers in when I arrived around 3pm, seemingly regulars. Both staff and customers were friendly and welcoming. There are two handpumps on the bar, but only one was on because there'd been a problem with their last delivery. Sharp's Doom Bar (£1.80/half) was in good condition. According to a sign seen in September 2017, children are only permitted in the pub until 8:30pm. Accessibility: Two steps to get in, another step between the two sides of the pub, and a couple more steps to the beer garden. Last edited 2019-03-31 12:27:41 (version 14; diff). List all versions. Page last edited 2019-03-31 12:27:41 (version 14).